"Taste and see that the Lord is good; blessed is the one who takes refuge in Him." (Psalm 34:8). 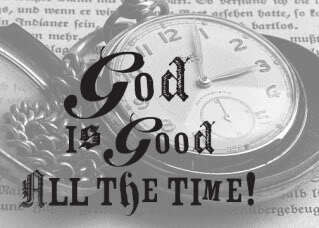 The pastor at the church we attended a few years ago during a service would often say "God is good all the time" and we as a congregation would respond with "and all the time God is good" What a difference this makes in my day if I remember this when the unexpected comes into your day. We have a television cable company that, a couple of seconds before the phone actually rings, it shows you who is calling in the corner of the TV screen. Now when you had a lot of labs done the day before and the name of your PCP shows up at certain time like late at night or on Saturday you pretty much know that the news isn't going to be good. Sure enough, the news wasn't good. The woman calling says, "Your labs are concerning. You need to get ahold of the hematologist and urologist." She faxes me the lab results so I have them to take with me and I can see for myself how messed up things are. I told my husband, "I am just tired of this I am sick and tired of being sick and tired." I call a friend to ask if she knows what some of the results mean and she says to me, "Just remember, God is good all the time." I reply with "and all the time God is good." My stress level immediately went down as I allowed myself to take refuge in Him. I was able to rest in the fact that God hasn't brought me through everything we have dealt with to leave me now. Yes, this is another potentially major bump in the road, and once again I will be dealing with something new, but I know that my strength comes from the Lord. I have nothing to fear. I can rest in the promise that He is my refuge. There are more tests to do and one of them gave me major side effects, but the doctor is aware of what happened and they are going to pretreat me to prevent the complications. At first the fear was building up inside me and didn't think I could do it, but a deep breath and gentle reminder that God is in control and He will take care of me, and I am okay with it. While we won't know for a couple of weeks exactly what is going on and what has to be done, I know that All the time God is good. . and God is good all the time. So I am blessed because I choose to take refuge in Him. Can you think of a time that you were truly blessed because you took refuge in God and allowed Him to bless you? Watch this Video "Turn Your Eyes Upon Jesus" with Alan Jackson. The hymns he sing are just simple and pure. I hope it reminds you that the stress of illness is never more than God can handle. If you are dealing with something whether it be physical, emotional, financial, relationship issues whatever it is I hope that you can take this promise and trust in the Lord, rest in His presence, and be blessed because He is your refugee. SAY THIS: Our Loving Heavenly Father, some days it is easy to allow fear, concern,or worry to come in and consume our lives. But I am so thankful that at those times we can turn to You and "taste and see that you are good." We can know that You are our refugee, You are our strength. I thank You for the reminder that You are good all the time and for the peace that gives to me. Lord, would You bless each one that is struggling today, would you let them feel Your presence and receive the blessing that You have for them? Thank You, for Your love for us. Help us each share Your love with someone we come in contact with today. Thank you for hearing and answering my prayer. Gratefully, In Jesus Loving Name I Pray, Amen." Have a Blessed Monday and God Bless you.